How much does it cost to travel to Chamonix-Mont-Blanc? How much money will you need in Chamonix-Mont-Blanc? €188 ($211) is the average daily price for traveling in Chamonix-Mont-Blanc. The average price of food for one day is €38 ($43). The average price of a hotel for a couple is €143 ($161). Additional pricing is in the table below. These average travel prices have been collected from other travelers to help you plan your own travel budget. Chamonix-Mont-Blanc (usually shortened to Chamonix) is a resort area near the junction of France, Switzerland and Italy. At the base of Mont Blanc, the highest summit in the Alps, it's renowned for its skiing. Year-round, cable cars take visitors up to several nearby peaks with panoramic views, including Aiguille du Midi above town, and Pointe Helbronner, across vast glacier fields on the Italian border. Chamonix is one of the oldest ski resorts in France and is known as the "gateway to the European Cascades." With the sheer white heights of the Mont Blanc ridge as its sensational backdrop, the Chamonix Valley shows the Alps at their most dramatic. First discovered as a tourist destination by Brits William Windham and Richard Pococke in 1741, it has become a wintertime playground of epic proportions, more than satisfying the most demanding skiers as well as those who pack themselves into its boot-stomping bars. In summer, lift-accessible highland trails offer thrilling panoramas to hikers, mountain bikers and other high-altitude thrill seekers. In Chamonix, the sights are all around. The beautiful scenery is hard to beat, and this is one of the top reasons for making the journey here. 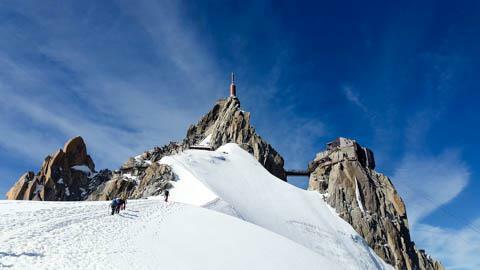 One of the top scenic spots here is Aiguille du Midi, one of Chamonix' most distinctive geographical features. If you can handle the altitude, the 360-degree views of the French, Swiss and Italian Alps from the summit are breathtaking (in both senses of the word). Year-round, you can float in a cable car from Chamonix to the Aiguille du Midi. Another great place for stunning sights is Mer de Glace, France's largest glacier, the 200m-deep Sea of Ice, flows 7km down the northern side of Mont Blanc, moving up to 1cm an hour (about 90m a year). Chamonix is a lively town known as both a world class ski resort and mountaineering destination. As a result, it is bustling with activity, in both the winter and summer seasons. Argentiere is another area within the Chamonix valley. It is a charming traditional ski resort area less populated than the main town area. It is full of authentic French charm and has a beautiful unspoiled high street with patisseries, shops, and wine bars. Le Tour is a typical Savoyard village nestled at the far end of the Chamonix Valley. Loss Bossons is a growing village situated under its own glacier. Les Houches a large commune at the bottom end of the Chamonix Valley. Les Praz is a beautiful village with access to the ski lifts & golf course. Valloecine is a pretty little village close to the Swiss border with gondola access to Le Tour. The list of things you could do in Chamonix is pretty extensive, and as you'd imagine mostly involves its iconic mountain ranges. However if being more sedentary on holiday is your idea of a great getaway, there are plenty of spas and relaxation options to choose from too. For the more active person, you could walk from here to Switzerland, or enjoy the great network of trails along the length of the Chamonix Valley. You could cycle around Mont Blanc on a multi-day trip. There is a cable car that will take you right to a glacier. You could take your first steps onto a glacier with a guide, or take the train to the Aiguille Rouges nature reserve and try spotting some of the local wildlife. Visit waterfalls, paddle down the river through the center of town on a raft, take a flight in a helicopter. In addition to these many options of ways to keep yourself busy, there are also some great museums like the Musee des Cristaux, which features many dazzling collection of crystals, rocks and minerals, many from around Mont Blanc, and the Musee Alpine, which richly illustrates the area's long history of Alpine adventure, including the cliff-hanging feats of crystal-hunter Jacques Balmat and the first ascent of Mont Blanc by a woman (Marie Paradis, a local maidservant, in 1808). Food and gastronomy in the Alps and in Chamonix play a tremendous part in the culture and daily life. Cheese and meats feature heavily on the menu and the Alps are widely renowned for a number of local dishes such as: Crozets, a buckwheat pasta, Rosti which is a kind of potato cake, and Fondue, which is very popular in this region. For a few ideas on restaurants, Chalet Refuge de Lognan, an atmospheric, rough old refuge two thirds of the way down the Grands Montets serving country French cooking, and Alpage de Balme, whose specialties include variations of Rosti. Geneva airport in Switzerland is the closest airport to Chamonix, so it would be easy to fly in here and take a taxi or airport shuttle to Chamonix, but if you plan to take the train in, it would probably be better to fly into Paris or Lyon to take the train from there. There are trains, buses, and cable cars in Chamonix that make getting around pretty easy- even to other nearby towns (or countries for that matter). Of course, hiring a car is another option that will get you straight from Geneva to Chamonix and also give you more flexibility.